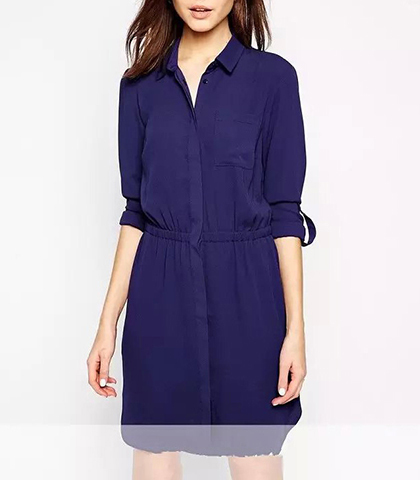 Shoulder N/A N/A 15" 16" 17"
Bust N/A N/A 35.5" 36.5" 37.5"
Length N/A N/A 38" 39" 39.5"
The traditional button front of this women’s shirtwaist dress means easy on and off for the busy woman on the go. This pretty dress is mini length with an elliptical hemline that is longer in front and back than it is on the sides. It has long sleeves that may be worn down or rolled up and secured into place at the elbows with Epilates. The collar is a traditional pointed one that opens into a slight vee neckline. The dress comes in a beautiful shade of Midnight Blue. We recommend dry cleaning only for this garment. It is available for purchase in sizes Medium, Large and Extra Large.